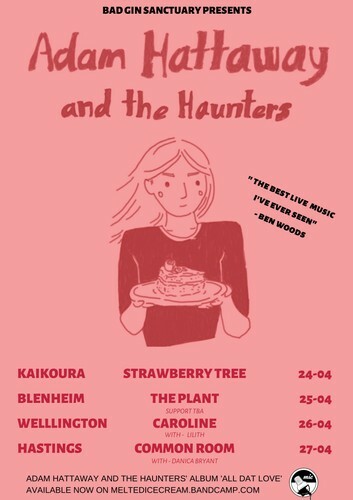 A.H & the Haunters are playing the Common room for the first time on April 27 and they can't wait! Having just recorded their second album, they're keen as to unveil the new stuff for you ASAP! Should a little head down minor chch student radio favourite (RDU Round up winners they were!) start believing in Sam and Dave and the rich classicism of the most honest booms of rock n rolls shallow past and then start playing like they kinda know how to do it? Should a band sound like they care deeply about the power of it all and yet know better than to? Probably not but young chch boy wonder Adam Hattaway (player of guitar in wurld Series, The Eastern and 1001 other bands too diverse from each other to even bother to even try and make sense of it.) and his band The Haunters have said f**k it, antied up to doing all of the above, but faster with more heart. They raise their drinks to making every bad idea sound good and righteous and that it made the most sense all along. And they made a record “All Dat Love”, because who cares about records anymore? They want to come and play for you, and they want to ask humbly, will you have them? Support from Danica Bryant Music!